Soluble in water. Slightly soluble in ethanol. Insoluble in dichloromethane. Dexamethasone 21-phosphate disodium salt is a system glucocorticoid with anti-inflammatory properties, is the pro-drug which is converted to dexamethasone in vivo. It stimulates uptake of glutamine in the cerebral cortex and induces apoptosis. In addition to binding to specific nuclear steroid receptors, dexamethasone also interferes with NF-kB activation and apoptotic pathways. It is freely soluble in water, slightly soluble in ethanol, and insoluble in chloroform and in ether. It is an inhibitor of the sodium phosphate symporter and GR activator. Additionally, it serves as an activator of food, medicine, glucocorticoid and anti inflammatory. Dexamethasone sodium phosphate (DSP), chemical name 16a-methyl-11β,17a,21-trihydroxy-9a-fluoropregna-1,4-diene-3,20-dione-21-Phosphate disodium salt, belongs to the adrenal cortex hormones. It has the effect of antiphlogosis by stabilizing the lysosomal membrane, reducing the release of lysosomal hydrolase; inhibiting the formation of inflammation-induced material bradykinin, serotonin and prostaglandin, increasing the stability of mast cells particles, reducing the release of histamine, concentrate blood vessels, stop white blood cells and macrophages from migrating outside of the blood vessels, etc. It can inhibit macrophage function to play immunization function and inhibit the formation of fibroblasts which is conducive to prevent corneal scar. When used for trauma, it can stop scar from forming and protect eyesight. It can inhibit or reduce the formation of new vessel in the cornea and conjunctiva disease and alleviate rejection reaction and scar formation in local use. In clinical treatment it can be used for autoimmune diseases, allergies, inflammation, rheumatism, asthma, ophthalmology and dermatology and other diseases. This product is white or off-white powder; odorless with slightly bitter taste and hygroscopicity. It can dissolve in water or methanol but is almost insoluble in acetone or ether. Melting point 233-235 ℃. This product can relieve and prevent the reaction of organization to inflammation. In the early stage of acute inflammation, it can reduce the exudation of local edema by inhibiting capillary permeability, leukocyte infiltration and phagocytosis and reducing the release of various inflammatory mediators In the late inflammatory phase, it can inhibit capillary and fibroblast proliferation and collagen protein synthesis to prevent adhesion and scar formation. This product can prevent or inhibit cell-mediated immune response, delayed allergic reactions,reduce the number of T lymphocytes, monocytes and brucella cells, reduce the integration ability between immunoglobulin and cell surface receptors and inhibit interleukin synthesis and release, thus inhibting the transformation of T lymphocytes to lymphocyte and pathological changes caused by allergic reactions such as allergic congestion, edema, exudation, rash, smooth muscle spasm, cell damage. and so on. This product also prevents the immune replenishment from getting through the basement membrane and can reduce the complement component and immunoglobulin concentration. In addition it can inhibit the transplant rejection reaction of tissue and organ and has certain short-term effect on autoimmune diseases. Inhibition of corneal epithelial regeneration, in the cornea, conjunctival disease can inhibit or reduce the formation of new blood vessels. This product is adrenal corticosteroid drugs. Its effect is similar to hydrocortisone but stronger with anti-inflammatory effect 40-50 times that of hydrocortisone and more notable effect of anti-inflammatory, anti-allergy, anti-shock than prednisone. It has quick efficacy and less side effects improving the body function in short time especially for the forst aid in critical illnesses. This product affects sugar metabolism and has strong function of anti-inflammatory, anti-inflammatory, anti-inflammatory and anti-allergy It affects water and sodium retention slightly and has strong inhibitory effect on pituitary-adrenal so it just causes slight side effects such as edema, hypertension,muscle weakness and so on. This product transpires through kidneys in urine after metabolic transformation in liver so the drug's plasma half-life can extend for people with liver and renal dysfunction. The concentration reaches plasma peak one hour after intramuscular and plasma protein binding rate is lower than other corticosteroids drug. Long-term use can cause iatrogenic Cushing's syndrome. For patients suffering from chronic wasting disease or mental disorders before, such mental symptoms may occur:euphoria, excitement, delirium, anxiety, orientation disorder or inhibition. Some patients with long-term local drug use may suffer hormone glaucoma and hormone cataracts. Glucocorticoid withdrawal syndrome. Sometimes the patient stop taking medicine may suffer dizziness, fainting tendencies, abdominal pain or back pain, fever, loss of appetite, nausea, vomiting, muscle or joint pain, headache, fatigue, weakness, which can be considered to be glucocorticoid-dependent syndrome adrenal insufficiency and the recurrence of original disease are excluded after careful examination. The product can reduce the effect of anticoagulant and oral hypoglycemic and attention should be paid adjust the dose. Patients with tuberculosis, acute bacterial or viral infections must be given appropriate anti-infective treatment. corneal ulcers are not permitted. When patient’s condition turns better dose times should be gradually reduced in case of recurrence. Patients with diabetes, osteoporosis, cirrhosis, renal dysfunction, and hypothyroidism should be cautious to take. After long-term medication, dosage should be gradually reduced before stop. Be careful in giving infant adrental cortex hormones administration because it can inhibit infant from growth and development. If long-term use is necessary, short-acting or medium-acting agents should be used instead of long-acting dexamethasone preparations and changes in intracranial pressure should be observed. Easy to suffer high blood pressure and diabetes. For old patients especially after-menopaue women the osteoporosis.tends to be severer. Patients with allergic history to this product and adrenal corticosteroids should not be permitted and in special case pros and cons should be weighed before use .Pay attention to the deterioration of the disease: It is not suitable for patients with hypertension, thrombosis, stomach and duodenal ulcer, psychosis, electrolyte metabolism, myocardial infarction , visceral surgery, glaucoma and so on. Eye drops: dexamethasone sodium phosphate eye drops, 5ml: 1.25mg. Injection: dexamethasone sodium phosphate injection, 1ml: 5mg, 1ml: 2mg. 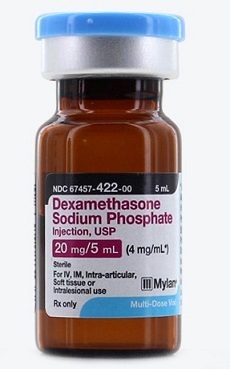 Dexamethasone sodium phosphate for injection, 10mg (based on dexamethasone sodium phosphate). New formulation: dexamethasone sodium phosphate temperature-sensitive in situ gel. An anti-excitment glucocorticoid and also a precursor drug that can be converted into dexamethasone in body stimulating glutamate to be absorbed into the cerebral cortex. It is used as adrenal corticosteroids clinically with anti-inflammatory, anti-drug and anti-allergy effect. White or almost white, very hygroscopic powder. ChEBI: An organic sodium salt which is the disodium salt of dexamethasone phosphate. Decadron (Merck); Dexacen (Cent); Dexacort (UCB); Dexair (Pharmafair); Hexadrol (Organon); Maxidex (Alcon). Poison by intravenous route. Moderately toxic by ingestion and intraperitoneal routes. Human systemic effects by intravenous route: peritonitis, central nervous system, and gastrointestinal changes. An experimental teratogen. Other experimental reproductive effects. When heated to decomposition it emits toxic fumes of F-, PO,, and Na2O. 2392-39-4 US $10.00 / KG 10G 99% 10MT Hubei XinRunde Chemical Co., Ltd.
2392-39-4 US $100.00 / KG 10G 99.9% 100kg/week Hubei XinRunde Chemical Co., Ltd.